The more I read about plant based diets, the happier I am to incorporate more meatless meals into our diet. We have all heard about the “Meatless Monday” trend, but I am working hard to extend that to 2 to 3 meatless meals a week. Although I will never be a vegetarian as I enjoy seafood and poultry too much, I do not have a hard time giving up red meat! 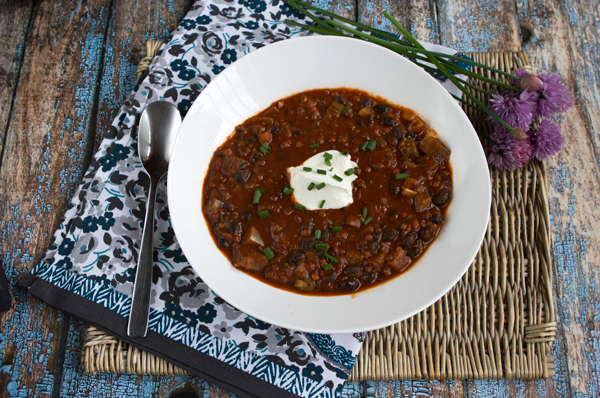 This amazing chili includes black beans, lentils and surprisingly eggplant as well, but is so full of flavor and hearty that you will never miss the meat! 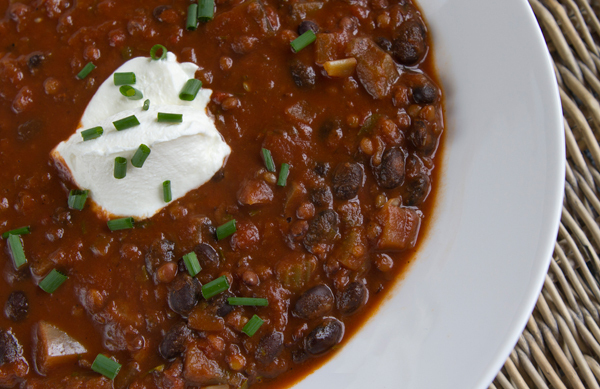 I topped our chili with fat free Greek yogurt which my husband prefers over sir cream as well as some chopped fresh chives from our herb garden. The high quantity of both protein and fiber in black beans help to move food through the stomach to the large intestine at a healthier pace supporting a healthy digestive system. The high fiber content also helps to curb hunger cravings. Black beans have the highest levels of antioxidants of all of the common beans tested, as much as the antioxidant-rich cranberry. Black beans are one of the best sources around for the trace mineral molybdenum which serves the useful purpose of breaking down the sulfites found in foods which some people are sensitive to. Black beans are also a good source of the minerals magnesium which helps to maintain a healthy blood pressure, iron to help maintain healthy red blood cells, and Folate, or vitamin B6, which is very important to pregnant women in particular. 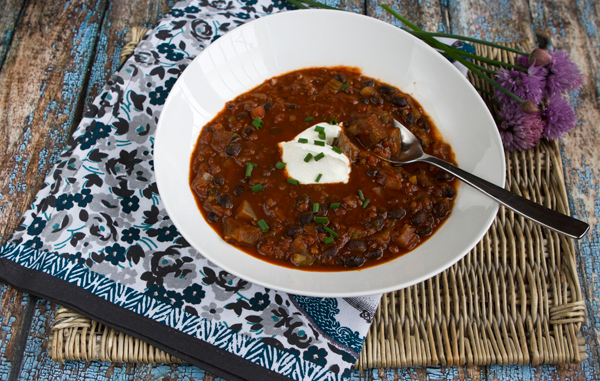 Eggplant adds substance to this chili replacing meat without losing any of the heartiness that chili is known for. Adapted from Food Network Magazine January 2014. In a large heavy stock pot, heat the oil over medium heat and cook the onions, celery, carrots and peppers for 4 to 5 minutes, stirring often. Add the garlic and eggplant and cook another 7 to 8 minutes or until the eggplant begins to soften. Add the cumin, chipotle, cayenne pepper, oregano, salt, pepper, and tomatoes and bring to a boil. Reduce the heat to low and add the lentils and cook until the lentils are just about tender, about 30 minutes. Add the beans and one cup of water, and continue to cook another 30 minutes until very thick. Stir the cilantro and lime juice into the chili, then serve with toppings of choice.